FlashGet is specifically designed to address two of the biggest problems when downloading files: Speed and management of downloaded files. If you've ever waited forever for your files to download from a slow connection, or been cut off mid-way through a download (or just can't keep track of your ever-growing downloads) FlashGet is for you. FlashGet can use up the lowest system resources and will not influence your normal work or study. 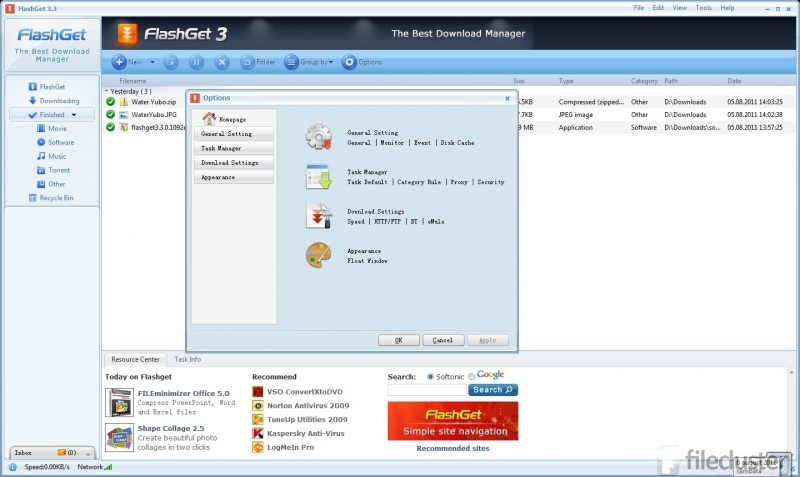 FlashGet can call anti-virus automatically to clean viruses, spyware and adware after finishing download. FlashGet supports HTTP,FTP,BT,MMS,RTSP and other protocols. It is seamless between protocols and there is no need to operate manually for download switch. The One Touch technique optimizes BT download and can automatically download target files after getting seeds information, hence no need to operate again. It supports unlimited categories. Each category is assigned a download saving directory. The powerful management feature can support drag and drop, adding and description, search, rename, etc.